In this video Ashley talks about taking part in Providence Row’s catering and bakery trainee schemes and what it has meant to him. Rise Bakery, part of London homelessness charity Providence Row, was named Social Enterprise of the Year at Homeless Link’s Excellence Awards on Tuesday 3 July 2018. The bakery, run from Providence Row’s day centre, combines a supported bakery trainee scheme for people affected by homelessness with an online brownie order business. With a strong online platform and an exciting contemporary brand Rise delivers post box friendly boxes all across the country to city corporates, retail customers, cafes and markets. Providing quality training trainees is essential to Rise Bakery who work with some of the most difficult to reach people. Their trainees are often affected by multiple disadvantages, such as rough sleeping, mental health and drug and alcohol issues, which can prevent them from gaining training and employment opportunities. Rise gives them something to be part of, motivates them as they tackle the issues they’re facing, and gives them to confidence to move towards employment. The Homeless Link Excellence Awards showcase the innovative, effective work that homelessness organisations are doing around the country to support those experiencing homelessness. The Social Enterprise of the year award recognises social enterprises that can demonstrate a clear vision, strategic direction and business excellence alongside a social impact that is creating better outcomes for individuals experiencing homelessness. Last orders for Christmas 2017! We hope you’ve got a fun and festive time planned this year. As we’re a small community bakery we will be closing over Christmas and New Year to give our bakers a well-deserved rest. We will be turning off the oven and hanging up our chef’s hats on Wednesday 20 December. Don’t worry though because we’ll be back baking our delicious brownies again on Tuesday 2 January. Fancy celebrating the season with some Rise Brownies? If so, get your order in before 2pm on Wednesday 20 December to help make sure we can get them in the last Royal Mail Christmas post for you (please note we cannot guarantee delivery dates). Hot on the heels of the Great Taste Award came news this week that Rise has been nominated for another award! We’re honoured to announce that we’ve been shortlisted by Blue Patch in their Social Impact category alongside some remarkable British social enterprises. Blue Patch is an online catalogue of British-made products and services with a sustainability edge. Their business awards recognise the efforts of social enterprises, SMEs and artisans who are committed to creating a principled economy. The Social Impact Award is for socially minded businesses aiming to make a positive difference in their local communities, whether that’s with vulnerable people, education or the environment. Rise Bakery is showcased for its bakery training scheme for people affected by homelessness. Watch this space for the judges’ verdict on 1 Sept. And don’t forget to bookmark Blue Patch in your browser as a your go-to place for ethical shopping. We think it’s brilliant. In the meantime though, we need your help! Blue Patch have invited the public to vote for their favourite nominee to win a People’s Award. Winning will give us the chance to tell more people about Rise brownies and mean we can help more people affected by homelessness. Meet Bobo, our new bakery peer mentor. He helps show new trainees the ropes. He has come a long way in a short time. Six months ago, he was homeless. He has since thankfully found somewhere safe to stay, but that was just the start of his journey towards the life he wants. Despite being off the streets, Bobo was still unhappy. Lonely and bored he spent most of his time in his room. “I didn’t go out at all”. That was when he found out about Providence Row (and Rise Bakery) and met with Asia from the Enterprise & Training team to talk about how to get back on his feet. He registered for the charity’s Bakery Trainee Scheme. Despite having “never made cake before in life,” Bobo quickly picked up baking skills and with it, his well-being and happiness improved. “I was happy, I told my children, ‘I’m going to make cake’”. Bobo didn’t stop there! Not only has he completed his Level 2 Food Hygiene accreditation, he’s also taken part in IT classes, Job Club, and recently started the Gardening Trainee Scheme. With past experience in security, Bobo is eager to get his badge back and return to work. He is seeing Annette, our employability coordinator for one-to-one support to achieve this. His love for the kitchen has led him to become a bakery peer mentor supporting and helping new trainees in the kitchen. Bobo has found that the activities at Providence Row have helped support his well-being as well as develop practical and transferable skills. He is happy and excited about the future. We won! We won! We are chuffed to bits to announce that Rise Bakery has been awarded a Great Taste Award for the second year in a row. We learned on Tuesday that our tempting White Chocolate, Orange and Coconut Blondie – our newest product – has picked up an illustrious gong from the Guild of Fine Foods. The judges loved the ‘fresh and zesty’ taste of our little golden cake bars, adding that the combination of ingredients ‘made them smile.’ And news of the award has certainly made us smile too, even more than usual! The blondie joins our Raspberry and White Chocolate Brownie as the second of Rise’s products to win a one star award, meaning judges have declared them both to be ‘simply delicious’. We couldn’t agree more. To give you a bit of background, Great Taste is widely acknowledged as the most respected food accreditation scheme for artisan and speciality food producers. Judged by over 500 of the most demanding palates, belonging to food critics, chefs, restaurateurs and producers, as well as a whole host of food writers and journalists, the Great Taste Awards offer a prestigious badge of honour for the winners and a clear sign to consumers that they are choosing a high quality product. So how are we celebrating? Well, apart from dancing around the centre bragging to anyone who’ll listen, we thought we’d share the smiles with you, our wonderful customers, with a week-long flash sale. Just use the discount code BLONDIE* to receive 15% off your purchase of White Chocolate, Orange and Coconut Blondie boxes. of Orange and Coconut blondies from our website. The code is subject to availability. withdraw this promotion before this time/date. We recently hosted an exchange visit from Daniel, who works in a homelessness service in Buffalo, USA as part of Homeless Link's Trans Atlantic Practice Exchange. He's written this fantastic blog about his experiences with us. Daniel here. I just wanted to take a little bit of time to describe my extraordinary experience this April at Providence Row. I was lucky enough to be selected to participate in the 2017 Trans Atlantic Practice Exchange, sponsored by Homeless Link and the US National Alliance to End Homelessness. The Transatlantic Practice Exchange is aimed at developing best practice connections between US and UK homelessness service providers around a variety of topics. These topics are selected by participants and part of the application process. 5 individuals from the UK come to the US & Vice Versa. My topic of choice was exploring how social enterprise can be used by organisations to provide both employment and training to individuals experiencing homelessness. It only made sense that I was matched with Providence Row & specifically RISE Bakery! While I only had the opportunity to spend seven days or so at Providence in total, everyone I encountered there made me feel as if I had already been part of the team for multiple years (yes even you too Pooja). Through shadowing and picking the brains of both Dom and Andrea, I began to see the origins and growth of Rise Bakery, practices and structures that sustain it, and most of all how Rise manages to stay focused on both high quality products and high quality services for trainees. When it comes to social enterprise, that balance is more of an art than a science. Dom and Andrea also arranged some amazing experiences that exposed me to other various social enterprises all over London. I got to chill out at Canvass Café and see how a large national charity like Crisis runs its Crisis Café. Unfortunately I did not see Russell Brand at his Trew Era Café, but I was able to buy some amazing coffee at Old Spike Roastery and chat with some of the founders around their enterprise and mission. I did my best to get my hands dirty as well! I was able to meet a couple of trainees and assist in making and serving breakfast (literally I just washed dishes). Later on I did the same with some baking, specifically a batch of Rise’s new orange and coconut blondie brownies. And one night I was able to do some street outreach with St. Mungo’s. While studying social enterprise was my primary mission, I couldn’t ignore the other services and supports around Providence Row. Whether that was chatting with Will about accommodation policies or hearing all about volunteer engagement from Stef, everything I did contributed to a positive experience. I am still trying to wrap my head around everything I learned while in London. One thing is for certain, couldn’t have dreamed of a better experience! Thank you Providence for hosting me, and keep up the great work! 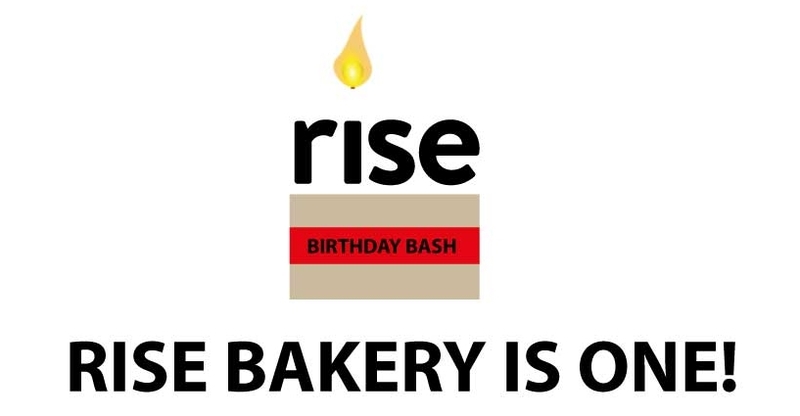 Rise Bakery started out a year ago today selling three flavours of brownies online from our base in Aldgate. As part of homelessness charity Providence Row we already had a kitchen, brilliant chefs, a fantastic group of baking trainees and volunteers, and a small bakery wholesale social enterprise, but we had never sold any products online before. It was an entirely new venture, with new products, name and website. I remember anticipating the launch on April 4th with both excitement and trepidation, not knowing what 2016 would bring. A year on our fledgling social enterprise really has risen. Since our launch in April 2016 we’ve won prestigious awards like A Great Taste award for our white chocolate and raspberry brownie, and come runner up at the Third Sector Awards for best re-brand. The Observer’s Jay Rayner and Great British Menu’s Matthew Fort have tried our brownies, and loved them! And we’ve have shout-outs on Twitter from cooking legends Nigella Lawson and Nadiya Hussain. We’ve run stalls in Spitalfields Market, taken part in food festivals and are now on the verge of launching three new products including a mocha brownie, an orange & coconut brownie and a biscotti, a recipe brought to us by Andrea our lead baker who joined us in 2016. We couldn’t have done it alone! We’ve had help from a food designer in developing the new brownie flavours. Advertising agency Unreal UK developed our new brand pro bono with great results. And a brilliant group of volunteers have helped us build and develop the website, sold our products at stalls as well as supported us with a range of other tasks to help us get off the ground. The Big Issue supported us with several features in their magazine, and even asked us to bake their 20th birthday celebration cake which featured their first ever front cover. The icing on the cake is that beyond all this Rise Bakery has supported 13 bakery trainees in the last year (through our accredited bakery trainee scheme) with seven of them having achieved accreditations with us. Our trainees will always be at the heart of what we do and we would like to thank them, and all of our customers, friends and partners for being part of this wonderful community. We’re looking forward to another jam-packed year ahead.